New York: The Mysterious Bookshop, 2015. Hardcover . Fine. viii, 371 pages. The signed, limited edition of the tenth Jack Reacher novel with a new introduction by the author. Published in an edition of 126 copies (100 numbered, 26 lettered). *** This set includes both a numbered and lettered copy in a custom folding clamshell box. Both volumes are bound in half leather and marbled paper-covered boards. Both volumes fine, signed by Child on the limitation page. Housed in a custom black clamshell box. Each book is wrapped in mylar and a plain paper jacket. A nice set for the Reacher completist. Present here are copies G and 27. 2006-03-07. New. Ships with Tracking Number! INTERNATIONAL WORLDWIDE Shipping available. Buy with confidence, excellent customer service! 2006-03-09. Good. Ships with Tracking Number! INTERNATIONAL WORLDWIDE Shipping available. May not contain Access Codes or Supplements. May be ex-library. Shipping & Handling by region. Buy with confidence, excellent customer service! 2006-08-06. New. Ships with Tracking Number! INTERNATIONAL WORLDWIDE Shipping available. Buy with confidence, excellent customer service! 2010-05-08. New. Ships with Tracking Number! INTERNATIONAL WORLDWIDE Shipping available. Buy with confidence, excellent customer service! 2007-06-02. Good. Ships with Tracking Number! INTERNATIONAL WORLDWIDE Shipping available. May not contain Access Codes or Supplements. May be ex-library. Shipping & Handling by region. Buy with confidence, excellent customer service! 2006-01-02. Good. Ships with Tracking Number! INTERNATIONAL WORLDWIDE Shipping available. May not contain Access Codes or Supplements. May be ex-library. Shipping & Handling by region. Buy with confidence, excellent customer service! 2011-05-03. New. Ships with Tracking Number! INTERNATIONAL WORLDWIDE Shipping available. Buy with confidence, excellent customer service! 2009-01-03. New. Ships with Tracking Number! INTERNATIONAL WORLDWIDE Shipping available. Buy with confidence, excellent customer service! 2007-09-01. New. Ships with Tracking Number! INTERNATIONAL WORLDWIDE Shipping available. Buy with confidence, excellent customer service! 2006-03-07. Good. Ships with Tracking Number! INTERNATIONAL WORLDWIDE Shipping available. May not contain Access Codes or Supplements. May be ex-library. Shipping & Handling by region. Buy with confidence, excellent customer service! 2011-03-02. Good. Ships with Tracking Number! INTERNATIONAL WORLDWIDE Shipping available. May not contain Access Codes or Supplements. May be ex-library. Shipping & Handling by region. Buy with confidence, excellent customer service! 2006-02-06. Good. Ships with Tracking Number! INTERNATIONAL WORLDWIDE Shipping available. May not contain Access Codes or Supplements. May be ex-library. Shipping & Handling by region. Buy with confidence, excellent customer service! 2006-06-08. Good. Ships with Tracking Number! INTERNATIONAL WORLDWIDE Shipping available. May not contain Access Codes or Supplements. May be ex-library. Shipping & Handling by region. Buy with confidence, excellent customer service! Bantam Press, 2006-01-01. Paperback. Used:Good. 2006-06-01. Good. Ships with Tracking Number! INTERNATIONAL WORLDWIDE Shipping available. May not contain Access Codes or Supplements. May be ex-library. Shipping & Handling by region. Buy with confidence, excellent customer service! Random House Large Print, 2006-05-16. Hardcover. Used:Good. Delacorte Press. Hardcover. 0385336691 New Condition *** Right Off the Shelf | Ships within 2 Business Days ~~~ Customer Service Is Our Top Priority! - Thank you for LOOKING :-) . New. Bantam Press UK, 2006-01-01. Hardcover. Used:Good. London:: Bantam,, (2006). Near fine in a fine dustjacket (appears unread, but noticeable toning to the pages).. First printing. True first edition of the 10th novel in the award winning series featuring Jack Reacher, an ex-military cop, and the ultimate loner. SIGNED on the title page. 397 pp. Condition: Near fine in a fine dustjacket (appears unread, but noticeable toning to the pages). Delacorte Press. Hardcover. 0385336691 Please allow 4 - 14 business days for Standard shipping, within the US. Thank you for supporting our small, family-owned business! . New. 2006-05-16. Delacorte Press. Hardcover. 0385336691 Please allow 4 - 14 business days for Standard shipping, within the US. Thank you for supporting our small, family-owned business! . Fine. 2006-05-16. 2010-05-08. Good. Ships with Tracking Number! INTERNATIONAL WORLDWIDE Shipping available. May not contain Access Codes or Supplements. May be ex-library. Shipping & Handling by region. Buy with confidence, excellent customer service! Bantam, 2010-09-07. Reprint. Paperback. Used:Good. Dell. MASS MARKET PAPERBACK. 0440241030 New Condition. . New. Bantam Books. Hardcover. B000JSDPUU New Condition. . New. Random House Large Print. Hardcover. 0375433392 New Condition. . New. Delacorte Press. Hardcover. 0385336691 New Condition. . New. Bantam. PAPERBACK. 0440423023 New Condition. . New. New York: Delacorte Press. Near Fine in Near Fine dust jacket. 2006. First Edition; First Printing. Hardcover. 9780385336697 . Gently read copy. International orders may require additional postage. ; Simply signed on the title page by Lee Child. Full number line. ; Jack Reacher, No. 10; 1.2 x 9.1 x 6.3 Inches; 384 pages; Signed by Author . 2007-09-01. Good. Ships with Tracking Number! INTERNATIONAL WORLDWIDE Shipping available. May not contain Access Codes or Supplements. May be ex-library. Shipping & Handling by region. Buy with confidence, excellent customer service! New York:: Delacorte,, (2006.). Fine in glossy illustrated wrappers.. Advance Reading Copy (trade paperback format. ) 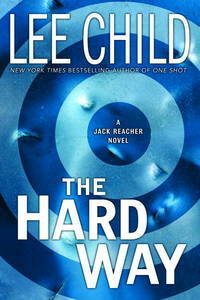 The tenth novel featuring ex-military cop, perennial loner, Jack Reacher - a knight errant for today's violent world. SIGNED on the title page. 371 pp. Delacorte Press. Hardcover. 0385336691 This hardcover book is Fine, being square and tight. The boards and spine have no wear with pristine lettering. The pages and endpages are clean, with no markings or folds. The dustjacket is As New. Original Price is intact. Not ex-lib. There is a pen mark (probable remainder mark) on the upper edge of the block. This copy is signed by the Author on the title page without inscription. . Fine. 2006. First Edition . New York: Random House Publishing Group, 2006. 1st. Hardcover. Fine condition / Fine condition dust jacket. Signed by the author on the title page. New York, New York, U.S.A.: Delacorte Pr, 2006. Book. Near Fine. Hardcover. Signed by Author(s). 1ST. An Excellent Copy - Signed By The Author On The Title Page. A First Edition, First Printing. Book Is In Near Fine Condition. Boards Are Clean, Not Bumped. Fore Edges Have A Tiny Bit Of Shelf Wear. Interior Is Clean And Legible. Not Remaindered. Dust Jacket Is In Near Fine Condition. Not Chipped Or Crinkled. Not Price Clipped. Dust Jacket Is Covered By Mylar Brodart. Thanks And Enjoy..
U.S.A.: Delacorte Press, 2006. Book. Near Fine. Hardcover. Signed by Author(s). 1ST. Signed By The Author On The Title Page. A First Edition, First Printing. Book Is In Near Fine Condition. Boards Are Clean, Not Bumped. Fore Edges Have A Tiny Bit Of Shelf Wear. Interior Is Clean And Legible. Not Remaindered. Dust Jacket Is In Near Fine Condition. Not Chipped Or Crinkled. Not Price Clipped. Dust Jacket Is Covered By Mylar Brodart. Thanks And Enjoy..
Delacorte Press, 2006 Advance reading copy. Includes a letter from publisher for the reader.. Special Edition. Soft cover. Near Fine. New York:: Delacorte,, (2006.). Fine in fine dust jacket.. First printing. The tenth novel featuring ex-military cop, perennial loner, Jack Reacher - a knight errant for today's violent world. SIGNED on the title page. 371 pp. New York:: Delacorte,, (2006.). Very near fine in a like dustjacket. . First printing. The tenth novel featuring ex-military cop, perennial loner, Jack Reacher - a knight errant for today's violent world. SIGNED on the title page. 371 pp. Advance Reading Copy. Illustrated wraps. In fine, like new condition, clean and unmarked. Signed letter from editor inlaid. null. Edition: Advanced Reading Copy. Advanced Reading Copy. Delacorte Press. Hardcover. 0385336691 This hardcover book is Fine, being square and tight. The boards and spine have no wear with pristine lettering. The pages and endpages are clean, with no markings or folds. The dustjacket is As New. Original Price is intact. Not ex-lib. No remainder mark. This copy is signed by the Author on the title page without inscription. . Fine. 2006. First Edition. New York, New York, U.S.A.: Delacorte Pr, 2006 Near fine in wrappers. Advance Reading Copy. Front free endpage reads: "On-Sale Date: May 16, 2006. $25.00".. 1st Edition. Soft cover. Near Fine/No Jacket.